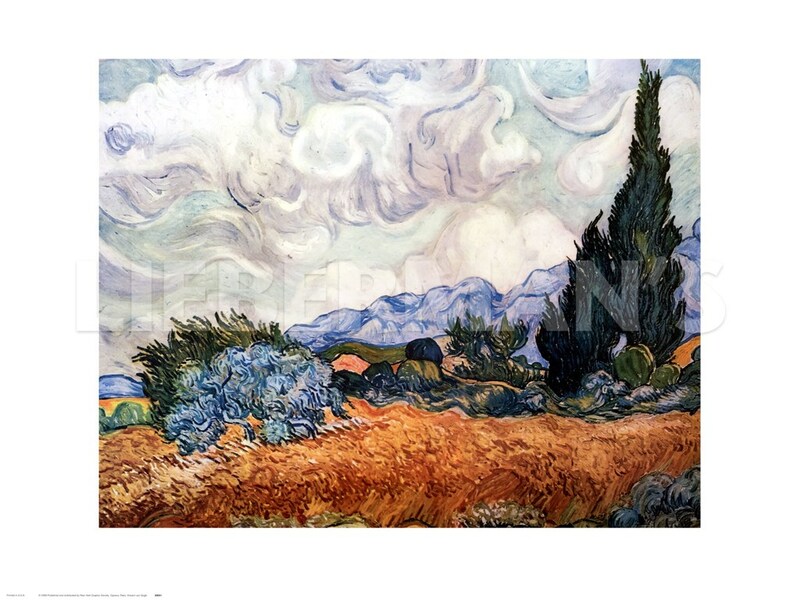 When Van Gogh was well enough to venture into the countryside in late May, this magnificent painting, completed a little later, was one of the results. Throughout June, he created a series of famously powerful landscapes, each bursting with a violent energy that many have attributed to his madness. However, for all the potential signs of a tormented mind that such works display, they were all painted during periods of remission. The swirling, heavily stylized forms, now instantly associated with Van Gogh, did not suddenly appear from nowhere - they mark a progressive development in his work rather than a radical break. The earlier Cloissonist influence of Gauguin and Bernard is finally assimilated. In the history of art, cypresses are traditionally a motif signifying death. Dark and somber, they normally belong in the cemetary. Despite a certain sinister air, which some have linked to Van Gogh's suicidal tendencies, the trees here are alive and vibrant. In fact the whole scene is vigorously animated, with each part shading into others. Nothing is stablek; everything that is solid melts into air.